Power Stone 2 is a fighting game that built on the innovative gameplay introduced by its predecessor, Power Stone. 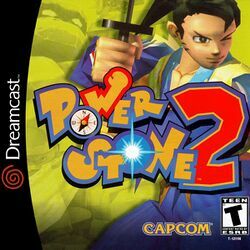 Power Stone 2 allows up to four players to choose from multiple characters and use the environment around them to gain an advantage over their opponents. This sequel introduced four new characters to the series, and also included multi-stage arenas that evolved over the course of a fight. This page was last edited on 6 October 2009, at 00:27.